Living in the tropics changes daily habits. Events, hobbies and activities that would be done indoors in other places are done outside in the South Florida warmth, and typically not far from a body of water. This also applies to our spiritual lives. In South Florida, people from multiple religious traditions come to the waters of Biscayne Bay – an expansive body of water that runs alongside Miami’s east coast all the way to the Florida Keys - to let go of sin, regret and shame, for symbolic cleansing, to be reborn. 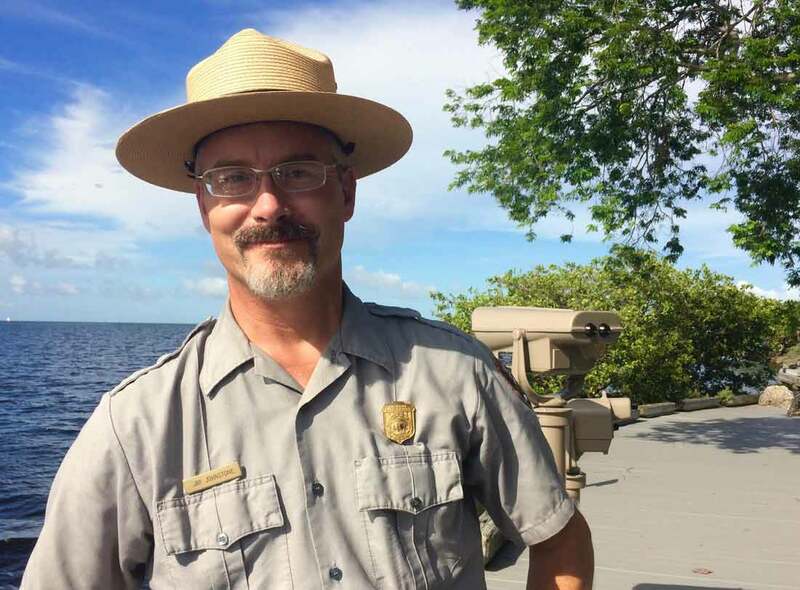 Biscayne Bay is a “mixing bowl.” That is how ranger Jay Johnstone at Biscayne National Park describes it. He explains how the meeting of the fresh water from the Everglades and natural springs and the salt water from the Atlantic Ocean create a special habitat for biodiversity. “We get this huge mixing bowl effect for subtropical and northern species and so this is sort of the northern extent for many southern species and it’s the southern extent for many northern species,” he explains. In some ways, Biscayne Bay is a mixing bowl of faiths, too. Spiritual practices of all kinds happen along its shores. The bay, with each baptism or mikvah or ritual, turns into a shared space of significance. "I changed my life here"
One clear summer afternoon in July, Channel Thompson stood in one of those spaces. It’s the beach at Homestead Bayfront Park, where the saltwater of Biscayne Bay flows into a man-made pond separated from the bay by a trail and some palm trees. “I changed my life here,” she said. Three years ago, she waded out into the water, fully clothed in black pants and a black shirt, to meet her pastor. She was being baptized in the bay. This is a calm spot, flanked on either side by swimmers. “I remember just walking out on this warm sand and as I got near the water, I was like - Oh my God, my life is gonna change in a great way. And I'm just ready,” she said. Thompson goes to Refuge Church, a “Christian fellowship” in Homestead. She says that during her baptism, some strangers stopped what they were doing to watch, and after it was done, they applauded. She says she believes God was present in the water that day. Jana and Mark Chase are born-again evangelical Christians. They’ve baptized 14 people in the waters of Biscayne Bay at Oleta River State Park. The Chases founded a Christian “inner healing ministry” together in 2012. 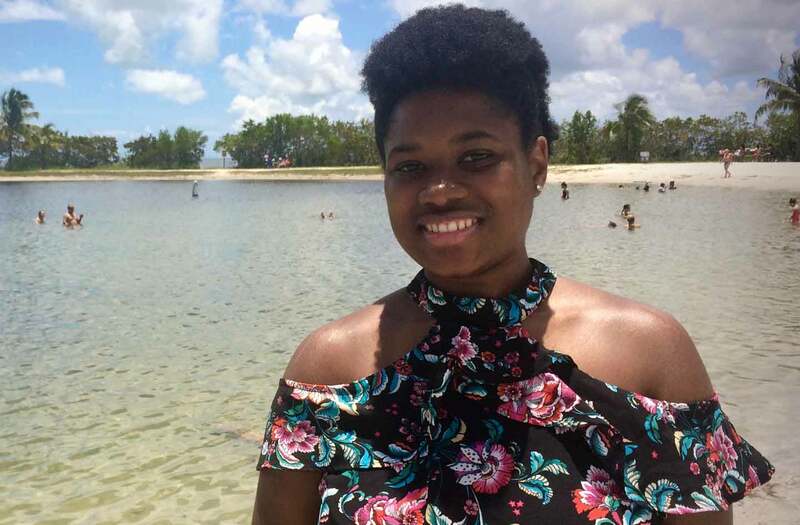 They say baptism can happen in any body of water, “anywhere, and through our faith, the presence of God’s spirit will be there,” but Oleta River State Park is the place they choose for the ceremony. "The heavens and the earth all together"
Some in South Florida’s Jewish community choose to submerge themselves in Biscayne Bay for their mikvah ceremonies, which are symbolic cleansing rituals. Mikvah ceremonies are used to honor personal milestones, like conversions and weddings, and there are even monthly mikvahs for Orthodox Jewish women to encourage fertility. Jacobs says having a mikvah ceremony there changes the way you experience the bay – it makes it full of meaning. “Every time you go after that, instead of ‘this is where I used to come play with my kids,’ is 'this is where I came to have a spiritual connection,” she says. And having members of the same faith share the water with those of different spiritual beliefs creates an invisible sense of community. “If the bay is already sacred but then somebody else is putting their holiness in it, then it absolutely becomes sacred,” Jacobs says. For Rabbi Judith Siegal, nothing can beat the natural beauty of an outdoor mikvah. Temple Judea congregation in Coral Gables also uses part of the bay for mikvah ceremonies – Round Beach in Matheson Hammock State Park. Rabbi Judith Siegal says there’s something special about an outdoor mikvah because the ceremonies typically happen indoors. Even with spa-like, state-of-the-art mikvah places, Siegal says nothing compares to the living water of the bay. “This, in terms of the natural beauty, I don’t think anything can beat it,” she says. On the afternoon of Rosh Hashanah every year, about 40 members of Temple Israel of Greater Miami walk four blocks east of their temple to Margaret Pace Park, where the congregation performs Tashlikh, a symbolic ceremony of repentance. Tashlikh translates to “cast away” in Hebrew, and after prayers and song, the congregation does just that: the participants face Biscayne Bay and each person throws a piece of bread into the water to represent their wrongdoings. Rabbi Tom Heyn of Temple Israel of Greater Miami says the Tashlikh ceremony is cathartic. “We have to think of the past year and become cognitive of our mistakes and shortcomings and make a promise to ourselves and others that we might change for the better,” Heyn says. That same water that carries away a congregation’s sins sweeps religious offerings ashore in Homestead. On a hot July afternoon, park ranger Jay Johnstone walks toward where the water meets the mangroves in some alcoves at Biscayne National Park. Leaves and branches and rocks crunch underfoot. Bugs hiss and chirp as the day fades into night. We are looking for offerings like those he’s seen throughout the years. “Let’s go down and take a look,” he says. He points to the gray mud, at what he says are religious offerings – a waterlogged pineapple, a broken coconut and a melon a few feet away. There’s part of a chicken skeleton stuck in the sand and a plastic bag tied to mangrove roots. Johnstone says he’s seen what looks like meat in the bags before, but he won’t touch them out of respect. Park ranger Jay Johnstone during an expedition to Biscayne National park to see some of the religious offerings left by the water. He says sometimes there are money offerings, too, like coins and other valuables. “They could be Santeria,” he says, barely pronouncing the ‘t’ in the word and emphasizing an invisible question mark at the end of his thought. Santeria is the popular name for La Regla de Ocha, says Michelle Gonzalez Maldonado, professor of religious studies at the University of Miami, and author of several books about Afro-Caribbean religions. 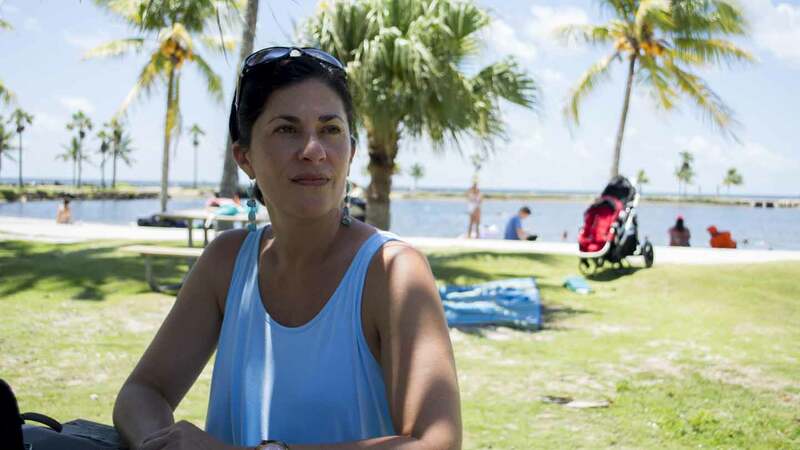 She says "there's no coincidence"that Biscayne National Park's landscape makes a perfect spot for practitioners because it has two important elements in Santeria: "el monte" â€“ the forest, lush green trees - and water. Santeria emerged when African slaves were brought to the Caribbean and forced to give up their spiritual practices. They continued their worship by disguising their gods as Catholic saints. For example, La Virgen de la Caridad del Cobre (Our Lady of Charity) is also the African goddess Oshun. That tradition was passed down through the generations, from abuelas to nietos and so on, morphing into different iterations. Rolando Beltran-Toledo became a santero in Miami more than a decade ago when he was 40. He had to do a weeklong purification ceremony and then wear white for a year in order to be initiated. He is a Cuban exile and he goes to the bay every Sunday to pay tribute to Yemayá, the female spirit who rules the seas. He considers her “his mother,” a guardian and a guide. The spot where he goes to offer prayers and play music with heavy drumming is a bit unexpected though. He goes to a Catholic church to do his Santeria prayers. Toledo stands by Biscayne Bay at La Ermita de la Caridad in Coconut Grove, a sanctuary devoted to Our Lady of Charity, patroness of Cuba. 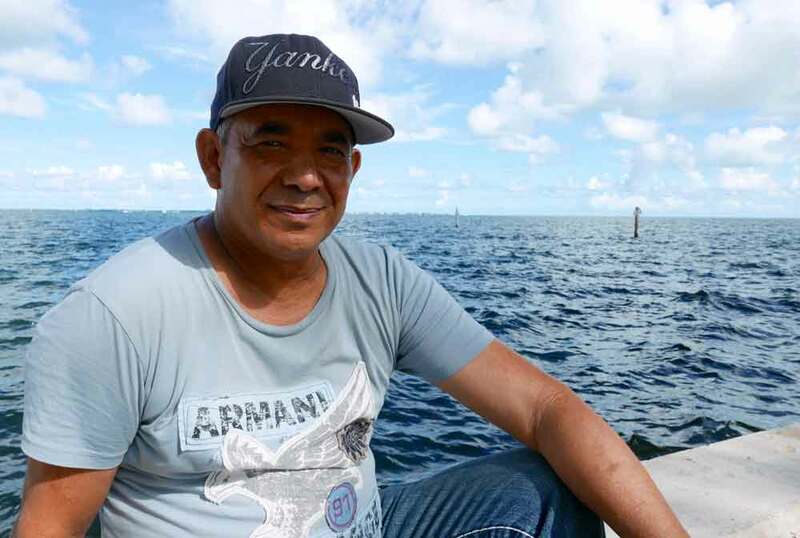 Rolando Beltran Toledo attends Mass regularly at La Ermita de la Caridad and then stops by the water to pay tribute to Yemayá, the female spirit who rules the seas. Toledo says he’s both a Catholic and a santero – what Maldonado said is called a “cruzado” or cross-practitioner. Toledo regularly attends Mass at La Ermita, honoring Our Lady of Charity and the Santeria spirits at the same time. He says he sees no conflict when practicing the two religions, and Toledo isn’t alone. According to experts, Afro Caribbean religions don’t demand the kind of commitment to one belief system that other religions do. “Intermixing religious practices and religious belief systems is much more common than, say, in the traditional monotheistic religions like Judaism, Christianity and Islam,” Maldonado says. Because Santeria and Catholicism are so tightly interwoven in Cuban culture, there are often a lot of blurred lines, like botánicas – Santeria shops – selling figurines of saints and small bottles of holy water. “They may be in church every Sunday, but when their child gets sick, they’re going to the botánica, to the Santeria priest or priestess,” Maldonado says. In another example of this Caribbean religious syncretism, many Cubans flock to La Ermita on Sept. 8, the day of Our Lady of Charity, also known as "Cachita," with bouquets of yellow roses and sunflowers. There are always a few flower vendors near the entrance of the church, too. But there is nothing in Catholicism or the Bible that makes a connection between the virgin and the yellow flowers – that’s Oshun. 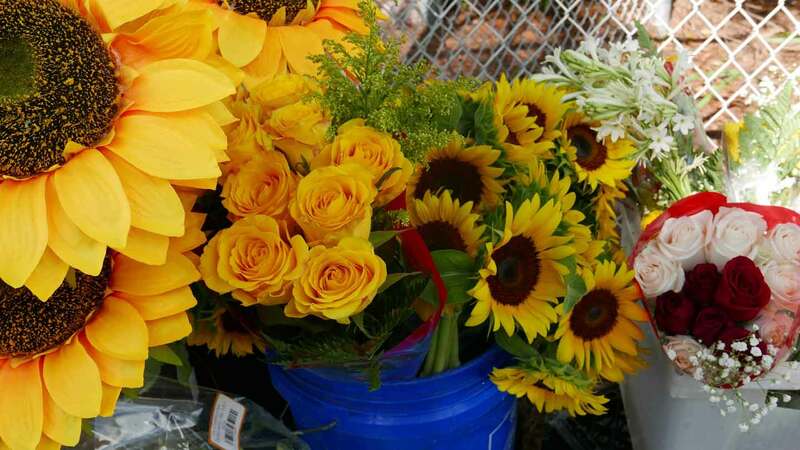 All santeros know Oshun’s favorite color is yellow, yet even people who consider themselves Catholic bring the flowers. "You can just stand there and look out at the ocean"
La Ermita is symbolic because La Virgen de la Caridad del Cobre is widely considered a connection between Cuban exiles and their homeland. Five years ago, the sanctuary constructed a miniature “malecón” behind the church. The real malecón is a five-mile-long seawall that runs along the northern edge of Havana, Cuba. La Ermita’s version runs along the bay, and it was a milestone when it was completed in 2012. For some Cubans, the malecón is transformative – Miami becomes Havana, and for Cuban-American Jessica Triana, the bay becomes the ocean. Worshippers line the wall before and after Mass. They just gaze out over the water. “Right there you can just stand at the malecón and you just look out at the ocean and you can feel like you’re in the island. Just close your eyes and you can see yourself in La Habana, en el malecón,” Triana said. Teresa Ortueda comes to Biscayne Bay before Mass many days to offer coins. She holds a few in her palm and then tosses them in the water. “I’m going to ask for health for me, for my kids and my grandkids, and my great-grandchildren too,” she says. The coins sink deep into the waters of Biscayne Bay, taking Ortueda's prayers and mixing them with the faith of thousands of other believers that see the bay as a place to meet the divine.